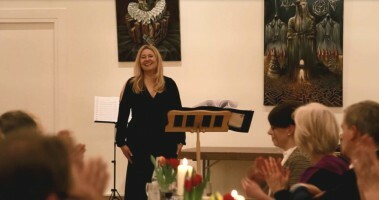 A Charity evening in favour of KisE e.V. (www.kise.de) . They help children lacking a large range of their intestine. They have to live on artificial nutrition and have a life expectance of about 30 years. With our event, we would like to donate for a holiday trip for these children in 2019. Enjoy a poetic and musical journey through Scotland, Ireland, Wales and England with native speakers recitation and lovely music – also to sing along if you like! Wine and beer as well as soft drinks cheaply available. Come and celebrate a typical British evening with us! Contact: Stefanie Niessen, Friends of Britain e.V. with your names for the guest list. First come, first serve! An event organised by 5 Hamburg Clubs: Friends of Britain e.V. 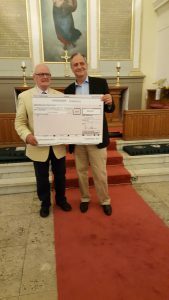 , British Club, Lions Club Hamburg Altona, Musikmomente e.V. and the First Hanseatic Toastmasters. Every year on the first Advent weekend the Friends of Britain e.V. 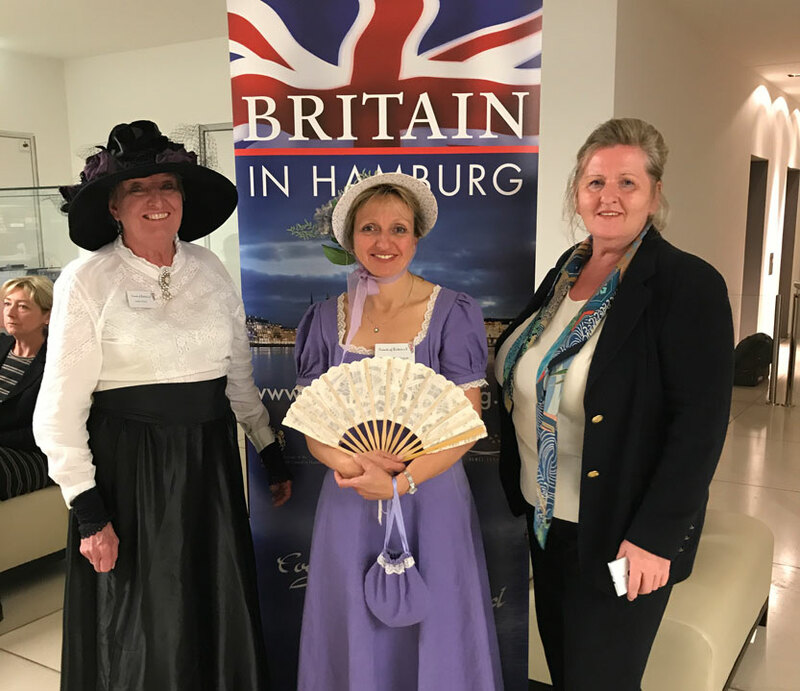 takes part in a Victorian Christmas Market in the Baseler Hof Sälen, originally initiated by the Honorary British Consulate in Hamburg together with the Hotel Baseler Hof and supported by several British clubs and associations and local businesses. Here one can enjoy the festive atmosphere of a Victorian Christmas. One can find a good selection of unique presents and fine gifts, as well as traditional British Christmas fare. There are prizes to be won and a light entertainment programme, various seasonal refreshments etc. enhance the event. On Friday, 29th of September Friends of Britain hosted a Charity Event at St Thomas Becket (the English Church). 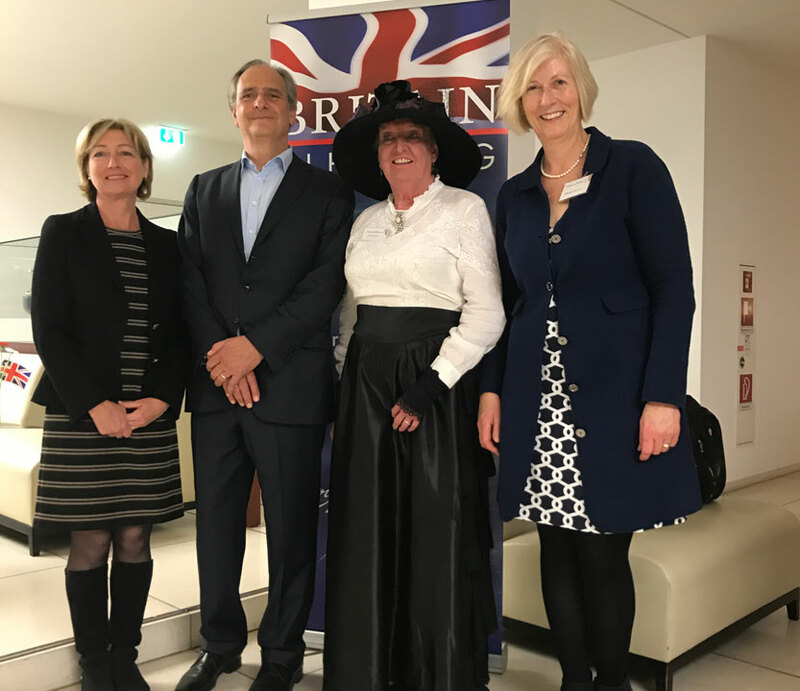 The German documentary film “Englands heimliche Hymne – Land of Hope and Glory” by Axel Fuhrmann & Axel Brüggemann was presented to an interested audience. It profiles the life and work of Sir Edward Elgar, both private and public, as well as his music and how his home area still celebrates his memory while the whole nation view “Pomp and Circumstance No. 1 / Land of Hope and Glory” as part of its cultural heritage. After the presentation and enthusiastic applause, the author, Axel Brüggemann, talked about the making-of the film and was happy to answer questions, posed by the audience. During snacks and drinks, prepared by members of FOB, everyone had the chance to chat with Axel Brüggemann and each other, as well as inform themselves of the main Charity donation beneficiary, Paulinchen e.V., which supports families within which a child has burn injuries. Co-operating with the specialized hospitals and fire departments is part of their work as well as offering direct help and creating awareness about prevention of accidents leading to such injuries domestically. In addition to the entrance fee, a small but high-quality tombola was organised and thus, at the end of the evening, donations were made of € 1,500 to Paulinchen e.V. and € 500 to St. Thomas Becket. 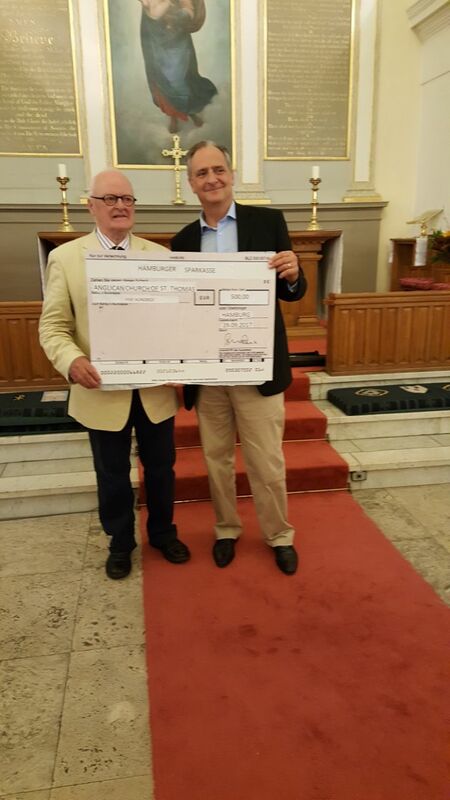 The symbolic cheques were handed to the representatives by our Patron and British Honorary Consul in Hamburg, Nicholas Teller, while Mrs. Linda Teller kindly drew the winning tombola tickets. Dear Friends of Friends of Britain! THE CULT EVENT for the whole family! That is pure German-British friendship! As usual the charity aspect will not be missing on this weekend – everywhere on the grounds and on the Tombola stand we will be selling tickets. There are many attractive prizes and vouchers to be won – the proceeds this year will go to the society “Benita Quadflieg Stiftung – Kinderhaus Mignon”. The “Kinderhaus Mignon” provides a new home for traumatized children in family-like residential groups as well as professional help. 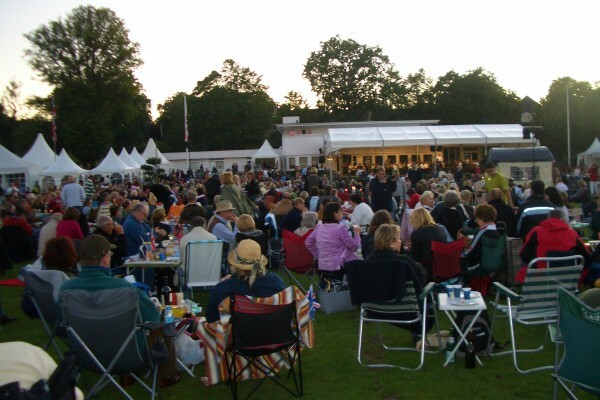 On the evening of 5th August 2017 you may look forward to the highlight of the weekend – the “Open Air Proms Concert“ where you can celebrate a summer night with our popular and witty conductor Russell Harris with his British humour. Let yourself be fascinated by our wonderful soloists Randall Bills (Tenor) and Richard Morrison (Baritone) as well as the “Hamburg Festival Orchestra“ with its talented musicians and their leader Ian Mardon. 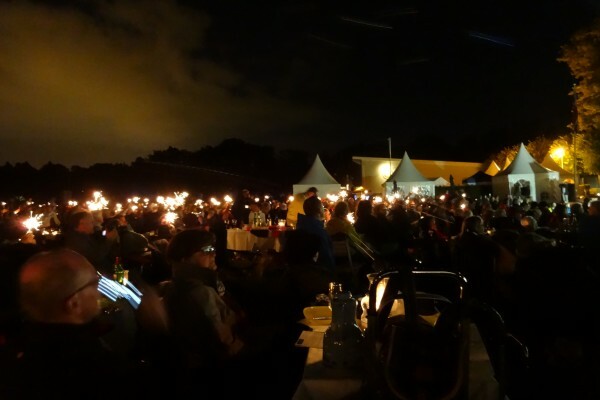 In the open air with a picnic (hopefully under a star-studded sky) on the Hamburg Polo Club field listen to the light classical music of Giacomo Puccini (Nessun Dorma! ), Georges Bizet, Giaocchino Rossini, John Williams, Andrew Lloyd Webber and Richard Rodgers. 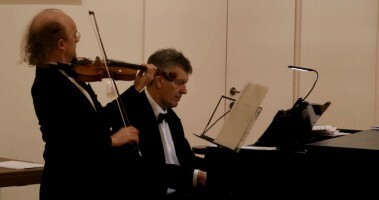 Traditionally, our concert ends with “Last Night” classics such as “Rule Britannia“, “Jerusalem“ and “Pomp & Circumstance No.1” with (Britain’s so-called “secret national anthem”) “Land of Hope and Glory” as well as the national anthems of both Britain and Germany, followed by a-cappella “Auld Lang Syne”. After a tasty glass of wine (or more), you will not find it difficult to sing along with all of these! Opening times Fri, 4.8. from 12:00 to 19:00,Sat, 5.8. & Sun, 6.8.2017 from 10:00 to 18:00. Open Air Proms Concert, 5.8.2017, at 20:30, gates open 19:00, tickets: advance bookings 28 € + advance booking fee under www.funke-ticket.de or http://www.britishflair.de/British-Flair-Hamburg-Open-Air-Proms-Concert.html – evening box office 32 €. As a highlight of European Week, on 16 May 2017 30 consulates and 4 cultural institutes opened their doors from 6 to 10 p.m. to interested members of the public. 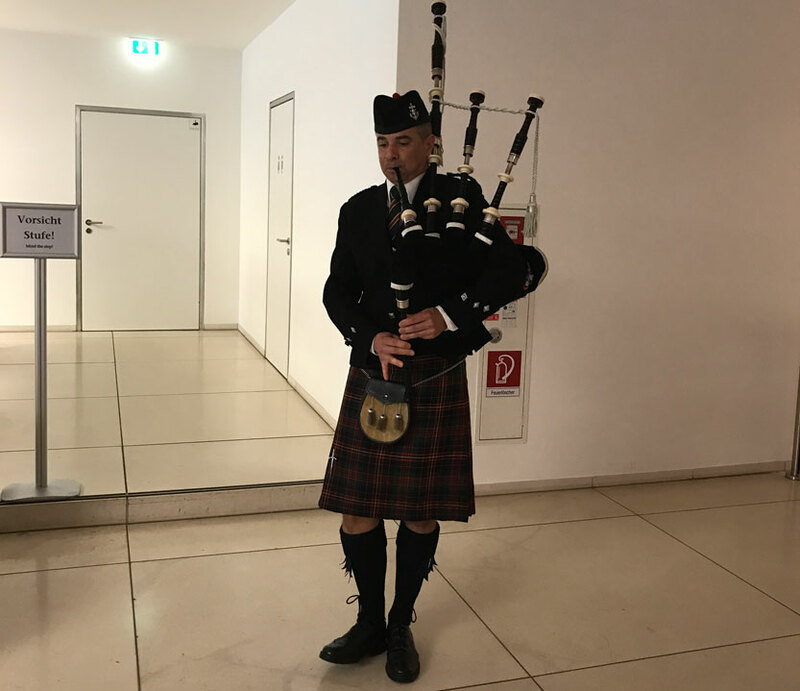 The Honorary Consulate of Great Britain and Northern Ireland in Hamburg was participating for the very first time. Various British or anglophile societies in our city presented an insight into their activities, including The Hamburg Players, The British Club Hamburg, The Anglican Church, Anglo German Club, First Hanseatic Toastmasters, The Arts Society of Hamburg, Country Travel, the English Tea Club and, of course, ourselves – Friends of Britain e.V. 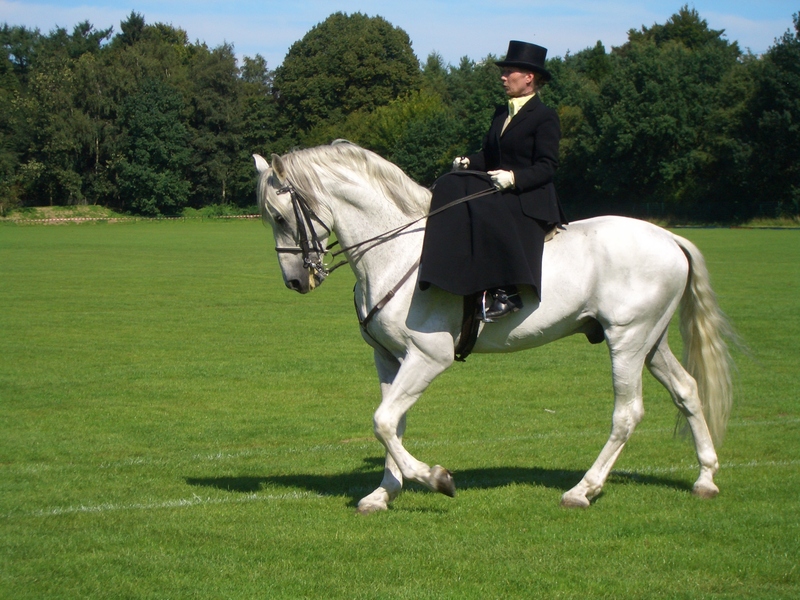 Two ladies from our team even appeared in Regency or Victorian costume. Paddington Bear was spotted incognito. 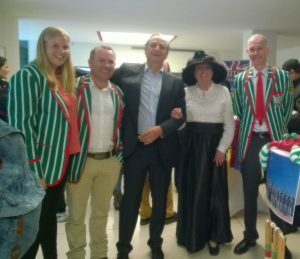 A visual attraction was provided by the members of the Heligoland Pilgrim Cricket Club, not only with their striped blazers: two men and a lady demonstrated their skills outside the Consulate, e.g. how to bowl and bat. Another great feature was Dennis Cole of the “St. Pauli Pipes & Drums“, who played the bagpipes both in the reception area and also outside. This drew in many passers-by – applause, photos, conversations – their interest in the British host country was quickly aroused. 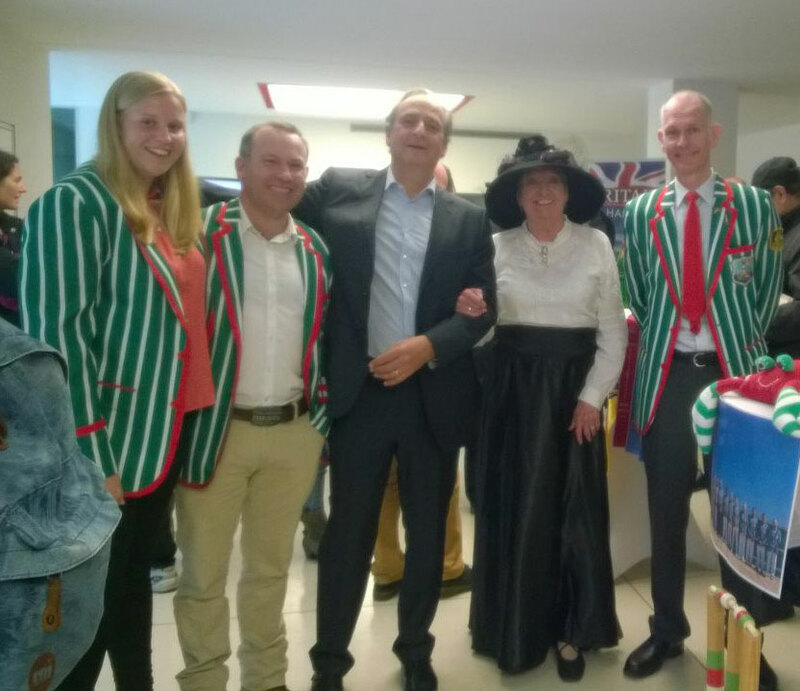 Besides information about culture, sport, the country and its people, around 250 visitors enjoyed original British sandwiches and colonial samosas, and also sampled a typical long drink, Pimm’s N°1. The British Honorary Consul, Mr. Nicholas R. Teller, who is also Patron of Friends of Britain e.V., was extremely satisfied with this successful premiere – and we can look forward to participating again next time next year. On 22nd January 2016, thanks to an invitation, we had the great pleasure of being able to take part in the “Tales and Tunes” evening in the Anglo-German Lodge. And what an inspiring, entertaining event „for a (truly) cold winter`s eve“! There was fascinating company, interesting conversations between and during the four courses of a creative menu and, in particular, artistic performances. The recitations of English poetry and ballads by Martin Hague, Norbert Schoen, Heiko Vogt and Linda Struck were most impressive, especially the endearing texts by John Holway. The superb musical interludes by Ian Mardon, Jon Mortimer and of course Stefanie Niessen provided a worthy framework. There was even an opportunity of singing some well-known songs together – And all this for a good cause, then without doubt the focal point and the actual purpose of the evening was: to support the Stiftung Mittagskinder. What a deserving organisation! A guided tour of the Lodge premises including a short introduction to the background of the Lodges concluded the unforgettable evening, and suddenly the clock reminded us that it was already just before midnight. Thank-you and looking forward to the next event of this kind ! We are grateful for the financial support given by Ter Hell. Upon the initiative of Honorary Life Member Clive Kennedy, Friends of Britain e.V. invited guests to the Hamburg premiere of the documentary film “The Queen’s Garden” about the trees, plants and wildlife in Buckingham Palace gardens. 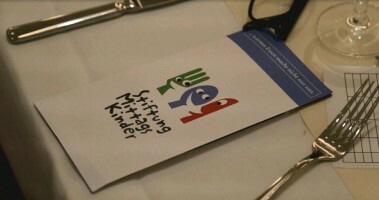 The event took place in the newly refurbished rooms of the Anglo-German Club Hamburg. 60 people, including our new Honorary Consul Nicholas Teller and his wife Linda, took part and enjoyed the film as well as a cold buffet and drinks during the interval. 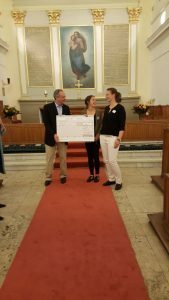 We were able to send a donation of EUR 2.000 to the “Runder Tisch Blankenese”, a forum that has been actively supporting refugees in the west of Hamburg for the past 25 years. Many thanks to Clive Kennedy for his initiative and for his kind donation of the refreshments for the evening. Our thanks also go to Harriet Wege of the Anglo-German Club for her assistance in organising the evening. Friends of Britain e. V.
Facebook: Friends of Britain e.V.